Week two of Slow Fashion October has just finished. The prompt for this week, “Small” was actually a big one for me. A lot of those words have been coming up for me over and over again this past year. From my interview with Ben Hole a few months ago about his family’s ultimate small-batch one-flock yarn to the ongoing Curious Handmade Wardrobe project, I’m diving into these themes repeatedly. What’s funny is that when I saw the prompt “Small” my mind immediately went to a slightly different place. I remembered a project I made eight yeas ago: my very first pair of handmade socks. The pattern was Falling Leaves by Jessica Landers, and I’ll never forget about it. It was definitely a slow project for me! But I gained a totally disproportionate amount of joy from such a small garment, I learned how to knit a sock, started to learn how lace operated…I’m pretty sure I followed the chart upside down and back to front and it was years later before I realised why I could never get it to look like the picture (slow process alright). I also used a completely inappropriate yarn for socks but loved the project so much anyway that it didn’t matter that I could only wear them around the house and to bed. With my current projects, I’m still stretching myself. Learning is still a slow process for me, and the results are still incredibly satisfying. I have just finished a single tunic dress. It’s a simple piece but the fabric feels wonderful. It’s a classic navy colour, which wasn’t the easiest to sew (at least not at night) but it will be a perfect capsule wardrobe piece. As a beautiful neutral canvas, it will look amazing with all my lovingly-knit shawls. After all the planning and talking about less being more, and quality over quantity, this piece feels like a real achievement…one small step closer to my ultimate goal of living with less. Now I’m planning a skirt out of The Fibre Co (Dry Goods) woollen fabric. This fabric is a new venture for The Fibre Co and is currently very small batch! With this project I really want to relish every small detail of the process, from start to finish. 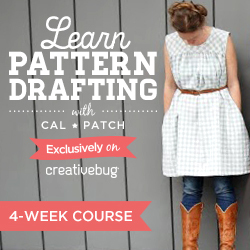 I plan to draft the pattern to fit me and take my time designing it exactly how I want it. This is a garment I want to suit me and and make me happy and no one else, without having to care if its “fashionable” or not!! I wrote a lot last week about my desire to live with less, and a more recent part of that process has been serious decluttering process. I went through my wardrobe pretty carefully, and selling/giving away so many clothes I didn’t love was a real lesson in not making rash, un-thought-out purchases. There were lot of things bought on sale because they were a good deal or in a rush because I was desperate for an event or change of size. They didn’t bring me joy. (A quality Marie Kondo talks a lot about in her wonderful book The Life-Changing Magic of Tidying Up.) Taking my time means I need a lot less things – and having a smaller wardrobe means it is much easier to see what will coordinate with what I have. It has dramatically shifted my shopping and making habits for the better.